The original Ramen Burger -- the iconic hamburger served on a ramen noodle "bun" -- became an instant favorite when it debuted at Brooklyn's Smorgasburg outdoor food market in 2013. Now, it appears that "Big Burger" execs have taken notice, with burger restaurant chain Red Robin announcing Tuesday it has developed its own take on the wildly popular and innovative ramen noodle-burger hybrid. 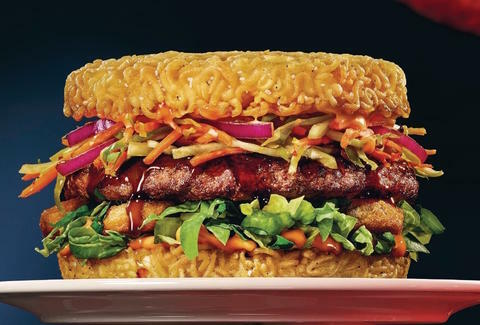 Although it doesn't directly credit the original Ramen Burger creator and ramen chef Keizo Shimamoto, a Red Robin press release claims the "food frenzy" around ramen burgers in NYC and LA inspired the company to take the food national with what's been dubbed the "Red Ramen Burger." The new menu item will hit Red Robin restaurants nationwide on April 4th, featuring a seasoned ramen noodle bun and toppings like teriyaki and Chiu Chow aioli as well as a medley of chili-infused shredded cabbage, carrot, and onion. In other words, they'll probably sell a zillion of them. Of course, the original Ramen Burger is much simpler -- made with a lightly toasted ramen bun that sandwiches a grilled beef patty, a smear of secret sweet-savory shoyu sauce, arugula, and scallions. When reached by email after Red Robin's announcement, Shimamoto said he was "very flattered" by the big restaurant chain's take on his creation. "I only wish they would have invited me to their tasting," he said. "Clearly it's not my original ramen burger, but I probably could have given them a few pointers on how to make it more authentic. Hopefully I'll at least get a gift card or something. ;)"
Hear that, Red Robin? Get the man a gift card. Tony Merevick is Cities News Editor at Thrillist and is looking forward to eating an authentic ramen burger at Smorgasburg sometime this spring or summer. Send news tips to news@thrillist.com and follow him on Twitter @tonymerevick.